Looking for the best restaurants in Naples, FL? You’re going to want to eat where the locals eat in Naples. 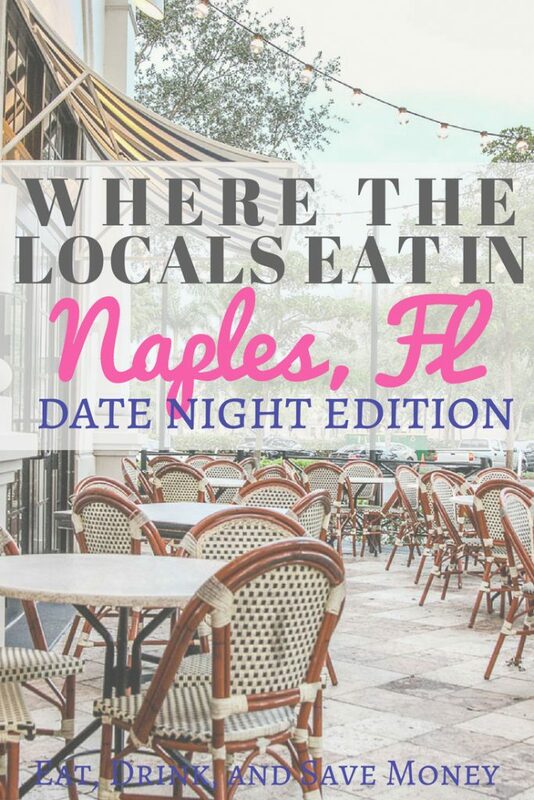 Whether you’re planning a trip to the Paradise Coast or you’re a local who has no clue where to eat, we’ve got you covered with this list of local Naples restaurants that are perfect for date night. 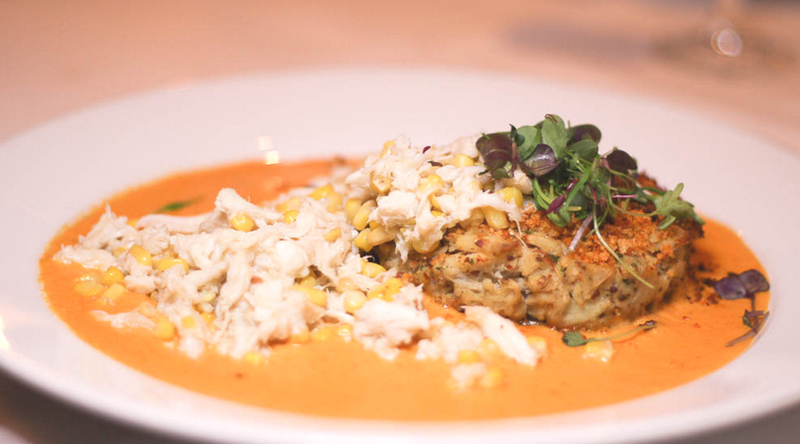 The crab cake from Ridgway Bar and Grill is perfect for date night in Naples. When we first moved to Naples we were overwhelmed by the many restaurants on 5th Avenue and 3rd Street South. There are so many restaurant options in town and we quickly found that it’s either hit or miss, not much in the middle, and most will be high priced. To be honest, there are a lot of tourist traps here. If you aren’t careful, you will find yourself with an overpriced yet subpar meal. Here’s the deal, we don’t mind paying a lot for a meal, but it better be a damn good meal. Instead of figuring out the best date night restaurants through trial and error, check out these recommendations of where the locals eat in Naples, FL. I asked a group of locals on a foodie Facebook group, Where to Eat 239, and these were the favorites. There are a ton of other great restaurants here in Naples. We have great brunch spots, hip bars, and even a few hole in the walls. I’ll be back soon with more restaurant suggestions for lunch, brunch, and hole in the walls that are worth a visit! This is the list of restaurants that are priced a little higher for date night, but definitely worth the money. No tourist traps on this list! Dorona, in my opinion, serves the best quality steaks in Naples at the best prices. Not only are the steaks reasonably priced ($29 for a 5 oz filet meal), many of them are local to Florida too. This modern Italian steakhouse is my top pick for date night in Naples. Tony Ridgway has been serving Naples since 1971. When you ask long time residents to name their favorite restaurant, many of them will say Ridgway’s because it is Naples hometown bar and grill. When you walk in, you can actually feel the hometown hospitality. The food is just as great as the atmosphere. Tony loves to travel and pick up new inspiration for recipes to include in his American cuisine based menu. Go for the delicious food, but stay for the hand crafted cocktails! The Bevy is trendy when it comes to foodie flavor combinations without being over the top. Chef Renninghoff’s dishes are classic combos with a foodie twist, such as the hot and crunchy trout with a kimchi pork belly fried rice. If you like trying new things, The Bevy is the date night spot for you. Head to Truluck’s if you are in the mood for steak or seafood. Make sure to try the stone crab claws when they are in season from October through May. In the mood for Italian? You’ll love the innovative and award winning cuisine at Campiello. The atmosphere on 3rd street south is impressive too. Nemo’s is known for a wide variety of seafood, including 4 different prime tuna entrees. Located on the bay, The Bay House is not only a great date night spot, it’s an amazing place for Sunday brunch. Head there for seafood and cocktails with a delightfully southern spin. Owned by a family from Provence, France, Bleu Provence is a quaint yet award winning French restaurant with a spectacular wine list. Timeless offers a contemporary twist on classic American comfort food with locally sourced and seasonal ingredients. When you walk by The Continental on 3rd Street, you almost feel drawn in. There are always people on the patio having a good time and enjoying the American steakhouse and craft bar. The restaurant also serves seafood and often has live music. It’s a must try if you like a night out on the town. It’s probably no surprise to find that Naples isn’t heavy on global cuisine. We have a lot of steakhouses, Italian restaurants, and sushi places. Naples is just now started to get more international food influence. When it comes to finding a good marriage of ethnic flavors, FUSE is the place to go. You can find Cuban, Asian, and even some downright strange protein like wild kangaroo! This is another great place to visit for ethnic cuisine. 21 Spices is the only Indian restaurant in town. Instead of serving a typical Indian buffet, the menu is elevated to a higher lever and served with a “distinctive progressive twist”. In the mood for traditional Spanish tapas and classic dishes with an international twist? You’ll love LaMorago. Lamoraga is a culinary concept that seeks the highest level of quality and taste, in order to offer its cuisine as a convenient luxury. Sea Salt is absolutely a must try for date night in Naples. When we first moved here, it was the number one recommended spot by all of our friends. Chef Fabrizio Aielli puts his Venetian touch on Florida’s freshest seafood and produce, using organic, sustainable ingredients from local famers and day boat fishermen. His menus change daily which make it a fun surprise. Located next to each other on 5th Avenue South, both Bar Tulia and Osteria Tulia are great options for date night. Osteria Tulia, Naples, Florida’s first osteria, serves exquisitely prepared rustic Italian cuisine in the ambiance of a convivial, lovingly restored Italian farmhouse. Head next door to Bar Tulia for a similar, yet more laid back menu. Ask anyone in Naples for a beach front fine dining recommendation and they will say The Turtle Club. While there are several laid back beach front dining options in Naples, The Turtle Club is the only fine dining on the beach. Go for the atmosphere, but return back for the delicious seafood that is reasonably priced. There are a lot of sushi places to choose from in Naples, but Komoon is definitely the one to try first. Komoon Thai Sushi & Ceviche Restaurant serves a unique and savory selection of some of the finest cuisines from the magical lands of Thailand, Japan, and Peru. There are so many other amazing date night restaurants in Naples. While I’d love to include every restaurant, I think this list is the perfect place to start if you have money saved up for date night but feel overwhelmed by all the options. What are your favorite date night spots in Naples?